An agrarian disturbance in 19th century Ireland, as locals stone a military eviction party. Maeve Casserly looks at the links between the ‘hedge schools’ and the rebellion of ‘Captain Rock’ in the 1820s. Between 1821 and 1824, much of rural southern Ireland was rocked by a rebellion of a movement known as the ‘Rockites’ after their anonymous local leaders, each named ‘Captain Rock’, an anti-hero figure comparable to Robin Hood. There was an attempt at full-scale insurrection in North Cork and thereafter, many months of attacks by Rockites on the persons and property of landlords, agents, ‘land-grabbers’ and troops, with occasional burning also of Protestant Churches. The Rockites killed over 100 people during these three years. The authorities responded with over 100 executions and exiled 600 Rockites to penal servitude in Australia. 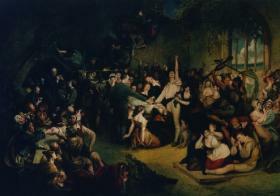 Between 1821 and 1824, much of rural southern Ireland was rocked by a rebellion of a movement known as the ‘Rockites’. A depiction of a 19th century hedge school. Education and the pursuit of knowledge has always been part of Ireland’s history.The writer Thomas Crofton Croker, in his 1824 study, Researches in the South of Ireland, highlighted; ‘the literary superiority of Ireland over the rest of Europe’ had long been the subject of ‘national exultation.’Correspondingly, Thomas Moore, (Irish poet, singer, songwriter and entertainer, now best remembered for the lyrics to ‘The Minstrel Boy’),highlights the significance of the education system in his most influential political work Memoirs of Captain Rock. 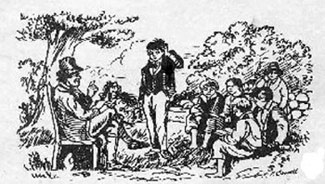 In William Carleton’s sketch ‘The Hedge School’ taken from his 1830 novel Traits and Stories of Irish Peasantry, the author outlined the Irish people as being ‘grateful, affectionate, honourable, faithful, generous and even magnanimous.’How then, in such a ‘civilized’ society could an exceptionally violent agrarian rebellion like the Rockite movement take place? Who was behind this movement? Some pointed to the informal education provided to the Catholic lower classes in the so-called ‘hedge schools’. Did the hedge schools – which sprang up to provide education to disenfranchised Catholics fuel the rebellion of ‘Captain Rock’? The hedge-schools had emerged throughout the countryside as a result of the harsh Penal Laws which had forbidden Catholic schools. One clear theme which emerges from the afore-mentioned three contemporary sources is that: the hedge schoolmaster played a pivotal role, as both an educator and prominent member in agrarian society, in encouraging the militant political and social sentiments which led to outbreak of the Rockiteviolence, and continued to fuel this violent mentality throughout the movement’s most intense period. These sources illustrate that the hedge schoolmaster influenced Irish agrarian society through his social standing in local villages, his control of the curriculum and the books that were taught within the hedge schools, the spread of millenarian beliefs and the prophecies of Pastorini (in fact an English Roman Catholic Bishop named Charles Walmesly who prophesied that 1822 would see the final victory of Catholicism over ‘heresy’), and the revival of the revolutionary nationalist language of the United Irishmen of the 1790s. ‘The Memoir of Captain Rock’. During the first decades following the Union, a new literary movement emerged in both England and Ireland, known as ‘improvement literature.’ This was to have a profound effect on contemporary portrayals of the Irish education system, in particular the hedge schools and schoolmasters and their power over Irish politics and culture. The first examples of such texts are Maria Edgeworth’s Castle Rackrent(1800)and Lady Morgan’s, The Wild Irish Girl, (1806). Both texts did much to create the image of ‘romantic Ireland’, and promote the belief that there was a ‘fair Hibernia’ that might be rescued from ‘irresponsible leaders.’ The idea of this ‘irresponsible’ management of the rural Irish hedge schools under the idiosyncratic leadership of the schoolmaster exercised a particular fascination over the minds of many English people. In their characterisations of the hedge schools and the schoolmasters, Moore, Croker and Carleton tailored their own work to fit into their readerships need to understand the Irish mindset of the 1820s. The Rockite movement was one of many secret societies, such as the Whiteboys or the Ribbonmen, organised by those at the bottom of the social spectrum in the late eighteenth and early nineteenth century, to defend the rights of labourers and poor tenants. The Rockite movement was at its most intense during the period 1821 to 1824, and began with the murder of the son of Alexander Hoskins, the agent of Viscount Courtenay’s estates around Newcastle West in Co. Limerick, by a party of seven men on 27 July 1821, headed by the original Captain Rock, Paddy Dillane. This incident was however, just the catalyst for a violent agrarian rebellion, which had been fuelled by a complex combination of political and social polarisation within the context of the emerging Irish identity under the Union. The characterisations of the hedge school and the hedge schoolmasters in Moore, Carleton and Croker’s works were part of a wider movement in Irish literary culture which sought to rationalise this new forceful Irish mentality within the Union. The most influential contemporary source which deals specifically with the Rockite movement is Moore’s Memoirs of Captain Rock. The aim of Moore’s Memoirs was to highlight to his British readership that Catholic militancy was a response to Protestant aggression and rarely for any religiously proactive reasons of their own. However, a contemporary critic wrote on 1 April 1824 in the Westminster Review that Moore’s Memoirs did not explain how ‘individual Irishmen are worked up into that state of excitement and ferocity’ but instead strengthened the ‘absurd prejudices which exist’ against these men. From this source in the Westminster Review, historianEmer Nolan concluded that Moore failed to depict Captain Rock as a ‘typical’ Irishman because of the language he used in Rock’s everyday speech. Similarly, Robert Portsmouth is also critical of Moore’s portrayal of the Captain, as those familiar with the vernacular of the chap-book histories of rebels, will see that Rock’s language has clearly been adapted by Moore for romantic drawing-room sensibilities. ‘The Installation of Captain Rock’ a 19th century painting. It was a surprise to many English readers that in an age which promoted the utilitarian philosophy of Jeremy Bentham and emphasised ‘useful learning’ that subjects like Greek, Latin and Hebrew, which formed an intrinsic part of the hedge school curriculum, were wastefully taught instead of necessary vocation skills.Despite the attempts of missionary groups such as the Kildare Place Society to use ‘improvement literature’ by authors such as Hannah Moore and Maria Edgeworth to influence the hedge school curriculum, the ‘chapbooks’ were far more popular because of their low cost and easy availability. The intermingling of classical texts with popular celebrations of heroic criminality and Catholic superstition that made the hedge schools so suspect in their involvement in forging the violent mentality of the Rockite movement. ‘Chapbooks’ were crudely produced works, printed on coarse durable paper, containing between eight to thirty pages, and covered an eclectic range of topics from religious tracts to chivalric expeditions. Such examples include, Paddy’s Resource, which was a popular ballad collection of the United Irishmen, or Irish rogues and rapparree, one of many criminal biographies. Both of these books are referred to by Moore’s Captain Rock as being in the ‘library’ of his own hedge school. The ‘pedagogy of the oppressed’ was evident in Captain Rock’s hedge school, where Ovid’s Art of Love was specifically paired with the popular insurgency of Paddy’s Resource, and Pastorini’sThe General History of the Christian Church (1771)on the curriculum. It was this intermingling of classical texts with popular celebrations of heroic criminality and Catholic superstition that made the hedge schools so suspect in their involvement in forging the violent mentality of the Rockite movement. This along with the fact that many hedge schoolmasters such as Lawrence O’Conner had been hanged in 1795 because of their pivotal role in the foundation of the sectarian revolutionary movement,‘the Defenders’in the 1790s. In ‘The Hedge School’ William Carleton also refers to the use of the classics in the curriculum, but in a much more negative tone than either Croker or Moore. Carleton proposed that the Irish people’s ‘barbarous’ education was solely as a result of the manipulation of the hedge schoolmaster: ‘they were trained and habituated to cruelty, revenge, and personal hatred, in their schools.’ In Carleton’s opinion, epic poems like The Iliad and The Aeneidwere twisted by the hedge schoolmaster to instil a love for violence, disloyalty and rebellion in its readers at a young age. While it is true that the pupil’s education and the extent of the curriculum depended entirely on the qualifications of the master, Carleton’s damning analysis is contradicted by a number of other contemporary sources. One such example was the opinion of Thomas Wyse [historian of the Catholic Association, 1829, and architect of the national education and provincial schools scheme], in a letter, dated from 1830, in which he expressed the belief that, ‘the lower class proportionally to their position, are better educated that the middle and upper classes.’ From this account it can be deduced that the curriculum was more extensive in the hedge schools than in any other school of equal social status, as was the standard of education. Contemporaries were unsure whether the hedge schoolmasters were themselves acting as ‘Captain Rocks’ or leaders of the agrarian rebellion. However, Carleton contended that the ‘wandering scholar’ often played a more sinister role in fuelling the violence of the Rockite movement. He proposed that the schoolmaster was a ‘notorious character’ and the ‘organiser of secret political societies’ between different communities and contributed greatly to the circulation of the millenarian ideas in oral form. This important role reprised their part in earlier popular political and agrarian agitation, particularly during the period of peasant politicisation of the 1790s. Some ‘wandering scholars’ did spread Millenial Catholic texts. The role of the schoolmaster in promoting the primitive millenarisim of the period, in the light of which some Catholics, in the years 1823-5, anticipated an imminent wholesale extermination of Protestants, can thus be seen in both contemporary literature and real-life incidents during the period of the Rockite movement. Together with the radical millenarianism of Pastorini, the new wave of Protestant evangelicalism of the early 1800s influenced the contemporary perception of the role of the hedge school and its teachers on the Rockite movement. 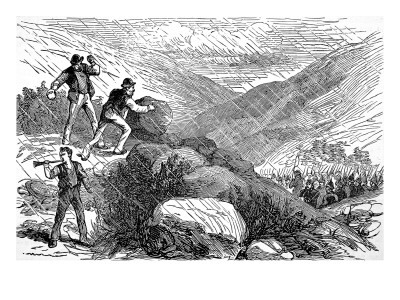 Similar to Moore’s romantic portrayal of Captain Rock, Croker’s image of the Irish peasant is equally idealistic, ‘a tattered Ovid or Virgil may be found in the hands of common labourers.’ Croker’s insinuation of the need to rescue this idealistic society is comparable to the attitude of Moore’s missionary’s perception of a nation in ‘a state of profound ignorance’ whose former glory days of her schools and colleges has disappeared. It is important to acknowledge that while the Rockite movement may not have been predominantly political in its motivations and aims; there were numerous important factors in this movement beyond the stereotypical agrarian issues of economic grievances, and millenarian aspects. The cult of 1798 and the revival of the language of the United Irishmen can be seen in both the accounts of the hedge schoolmasters and in the rhetoric of the threatening letters and notices of the Rockite rebels, written by many of the schoolmasters. The Rockites were nationalists of a sort, with ‘the Irish nation’ figuring prominently in their threatening notices. The idea of the Irish ‘nation’ was one which featured regularly in the Rockite rhetoric. One such example can be found in a threatening notice which in December 1821 complained: ‘We are oppressed by the tyrannical laws of the English government, which we can endure no longer . . We [will] have the Irish parliament and king crowned in Ireland, as these formerly was.’ Books on ‘rapparee literature’ such as the History of Feeney the Robber, had been read in hedge schools for over twenty years prior to the 1798 rebellion, and the fact that they were still popular might well suggest the prevalence of attitudes favourable to United Irishmen. Carleton wrote that in the hedge schools ‘Eulogiums on murder, robbery, and theft were read with delight’, he mentioned in particular the popular chapbook, the Irish Rogues and Rapparees. Through these books Carlton argued that ‘their knowledge was directed to evil purposes—disloyal principles were industriously insinuated into their minds by their teachers, most of whom were leaders of illegal associations.’Similarly in Moore’s Memoirs of Captain Rock,the Captain’s rebellious nature seems to be ingrained in him from an early age. Emer Nolan’s points out that in these lines Moore first cites the voice of the Rockites and offers a literary equivalent of the threatening letters and oaths of the secret agrarian societies. This revival was the product of the structure and tradition of the local society as the divisions created in the 1790s were not extinct and at times resurfaced. In the late 1820s it seems as if hedge schoolmasters moved away from the Rockites and towards the peaceful mobiliations favoured by Daniel O’Connell. Moore, therefore, re-orientated the threatening ‘Captain Rock’ towards the new strident voice of Catholic middle-class politics of the mid-1820s. Thus the Memoirs, as part of the wider movement of ‘improvement literature’civilized the most fearful feature of Irish popular culture. It was, consequently, integral to the O’Connellite project of weaning the rural poor away from violent, local agrarian movements and leading them into non-violent, national politics. In the works of Moore, Crofton and Carleton, the difficulty in representing an often violent Irish agrarian society to the ‘polite sensibilities’ of an English readership is apparent. The influence of the hedge schoolmaster in Irish agricultural society during this period, as seen in contemporary literary work, is evidence of the need to redefine Irish identity through a mentality of the pedagogy of the oppressed. This attitude was stimulated by two closely linked notions prevalent in Irish society during this period; the idea of Ireland as the ‘holy nation’ and Ireland the ‘sorely oppressed nation.’ The characterisation of the hedge schoolmaster and his role in the Rockite movement found in the‘literature of improvement’ of the first decades following the Union was thus part of a wider re-adjustment of the formation and perception of Irish identity influenced by a combination of increased religious and political polarisation, sectarianism, and millenarian beliefs. Carleton, William. The Traits and Stories of the Irish peasantry: second series, (Dublin 1830; latest edn London & New York , 1979). Croker, Thomas Crofton. Researches in the south of Ireland : illustrative of the scenery, architectural remains and the manners and superstitions of the peasantry, with an appendix containing a private narrative of the rebellion of 1798, (London 1824; latest edn Shannon, 1964). Moore, Thomas. The Memoirs of Captain Rock the celebrated Irish chieftain with some account of his ancestors written by himself, (London 1824; latest edn, Dublin 2008). Boyce, D. George.Nineteenth Century Ireland, The Search for Stability, (Dublin, 2005). Danaher, Kevin. ‘Introduction’, Researches in the south of Ireland : illustrative of the scenery, architectural remains and the manners and superstitions of the peasantry, with an appendix containing a private narrative of the rebellion of 1798, (London 1824; latest edn Shannon, 1964) pp. vi-viii. Donnelly, James S. Jr. Captain Rock, The Irish Agrarian Rebellion of 1821-1824, (Cork, 2009). Dowling, P. J. The Hedge Schools of Ireland, (Dublin 1968). Gibbons, Luke. ‘Between Captain Rock and a Hard Place: Art and Agrarian Insurgency,’ in Tadhg Foley and Seán Ryder (eds.) Ideology and Ireland in the Nineteenth Century, (Dublin, 1998), pp. 23-43. Gibbons, Stephen. ‘Introduction’, Captain Rock, Night Errant : The Threatening Letters of pre-Famine Ireland, 1801-1845 (Dublin, 2004) pp. 9-44. Katsuta, Shunsuka. ‘The Rockite Movement in County Cork in the early 1820s’, Irish Historical Studies, Vol 33.Issue 131. (May, 2003) pp. 278-296. McManus, Antonia. The Irish Hedge School and its Books, 1695-1831. (Dublin 2004). Nolan, Emer. ‘Irish Melodies and Discordant Politics: Thomas Moore’s “Memoirs of Captain Rock” (1824)’, Field Day Review, Vol 2. (2006) pp. 40-53. Nolan, Emer. ‘Introduction’ The Memoirs of Captain Rock the celebrated Irish chieftain with some account of his ancestors written by himself, (London 1824; latest edn, Dublin 2008) pp. xi-li. O’Connell, Helen. Ireland and the Fiction of Improvement, (Oxford & New York, 2006). Portsmouth, Robert.‘Memoirs of Captain Rock, Review’, History Ireland ,Vol 17. Issue 1. (Jan/Feb 2009). Wright, J.M. ‘“The Same Dull Round Over Again”: Colonial History in Moore’s Memoirs of Captain Rock’, European Romantic Review, Vol 14. Issue 2. (2003), pp. 239-249. Thomas Crofton Croker, Researches in the south of Ireland : illustrative of the scenery, architectural remains and the manners and superstitions of the peasantry, with an appendix containing a private narrative of the rebellion of 1798, (London 1824; latest edn Shannon, 1964). p. 325. Thomas Moore, ‘The Memoirs of Captain Rock the celebrated Irish chieftain with some account of his ancestors written by himself, (London 1824; latest edn, Dublin 2008),p. 6. William Carleton, The Traits and Stories of the Irish peasantry: second series, (Dublin 1830; latest edn London & New York , 1979), p. 186. Emer Nolan, Irish Melodies and Discordant Politics: Thomas Moore’s “Memoirs of Captain Rock” (1824)’, Field Day Review, Vol 2. (2006), p. 46. Croker, Researches in the south of Ireland, p. 327. Luke Gibbons, ‘Between Captain Rock and a Hard Place’, p. 34., Moore The Memoirs of Captain Rock pp. 126-127. Luke Gibbons, pp. 40-41. McManus, p. 55. Stephen Gibbons, ‘Introduction’, Captain Rock, Night Errant : The Threatening Letters of pre-Famine Ireland, 1801-1845 (Dublin, 2004), p. 40. Croker, p. 329., Stephen Gibbons, p. 14. Nolan, p. xxxvi, Moore p. 98. 2 Responses to "Did Captain Rock spring from the Hedge Schools? – Popular education and militant politics in 1820s Ireland"